In last month’s blog, we discussed using existing retirement savings to capitalize your own business venture with a Business Funding IRA. When you will have personal involvement in the business, that program provides an IRS compliant means of retirement funding without taxes or penalties. Many of our clients have an interest in investing in business opportunities where they are not directly involved. With a self-directed IRA LLC or Solo 401(k) plan, you can put your tax-sheltered dollars to work in various forms of privately held companies. If you know someone with a great idea needing capital for a start-up, or a successful businessperson in your network who is looking for expansion funding, your self-directed plan might be able to participate in the opportunity. When it comes to investing in businesses with IRA or 401(k) funds, there are some critical things you need to know to ensure your transaction is within the IRS guidelines and will be tax-preferred. One of the primary rules associated with any IRA investment is keeping things at arms’ length and avoiding disqualified parties. When it comes to investing in businesses, a clear understanding of what this means is especially important. You cannot use your IRA to provide start-up capital to your son’s business, for example. That is pretty clear-cut. It could also be problematic if your Solo 401(k) made an investment in a start-up, and your daughter was subsequently hired by that startup as an employee. The IRS rules prohibit any direct or indirect benefit between a plan and a disqualified party, and if there is an indication that the opportunity for your daughter to gain employment was linked to your plan’s investment, the IRS could have a problem with that. This does not mean that a business venture needs to be 100% clear of family involvement. In many cases, the opportunities that present themselves may be within a pretty close circle of your family network. You just want to be sure there is no benefit being provided by the plan to a disqualified party, or the reverse. In the second example above, it would likely not be a problem if your daughter was already working for a company in a rank-and-file role and your IRA made an investment into that company. As long as your daughter does not control the company in any fashion via equity ownership or a director level role, the company itself is not viewed as a disqualified party. The coincident timing of an investment by your plan and her being hired would create the potential issue of concern. But if her employment and your IRA investment were separated by a considerable period of time, then there is no risk of it looking like “the IRA bought her a job”. We have worked with several clients who have been offered an opportunity to invest in the company they work for. This does not create a problem unless they are in some way in control of the business. The list of disqualified parties extends beyond just family. Any business investment will need careful consideration if it involves someone who is a fiduciary to your IRA, a key employee such as a vice president of a company that you or a close family member owns, or someone with whom you are a business partner. An IRA or Solo 401(k) may not invest into a S Corporation. This is not an IRA issue, but rather a restriction on the types of shareholders allowed for S Corporations. Only individuals who are US citizens and certain forms of trusts or estates may be S Corporation shareholders. Another key consideration when evaluating a potential investment into a business is whether the investment will create exposure to Unrelated Business Income Tax (UBIT). This tax applies to tax-exempt entities such as retirement plans when they are engaging in a trade or business on a regular or repeated basis. The intent of UBIT is to level the playing field so that tax-exempt entities do not drive tax-paying businesses out of business. If your IRA is investing in the stock of a C Corporation, then UBIT is not a concern. The business income will be taxed at the corporation level and income to the IRA will be in the form of dividends, which are considered passive income. If your IRA is investing in a partnership or LLC, then taxes are not paid at the entity level and tax liability is passed through to the owners. 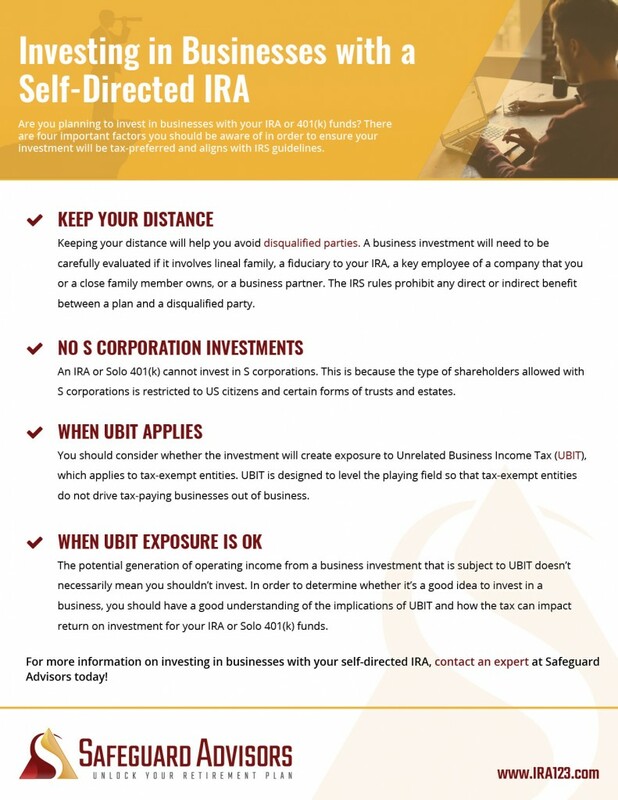 If the income producing activity of the business is a product or service, then the IRA will likely be subject to UBIT. If the nature of the income produced by the entity is passive, such as rent from real property, royalties, or interest, then UBIT will not apply. So, investing in a LLC that operates a restaurant will have UBIT exposure. Investing in a partnership that owns an apartment complex for rental will not. The fact that an investment in a business may generate operating income that is subject to UBIT is not always a deal killer. You just need to understand the implications of UBIT and how they impact the return on investment for your IRA or Solo 401(k) dollars. In general, this depends on where the return is generated. If the “prize” is the general operating income of the business, then UBIT will likely diminish the appeal of that investment for an IRA. The problem is that UBIT is taxed to the IRA at trust rates, which can be as high as 39.6%. That is generally a higher rate than you would pay personally. Unless the ROI from the investment is significantly high to the point that the post-UBIT returns are still significantly better than any other investment you can think of for your IRA, it probably does not make sense to pursue such an opportunity. In a more classic venture capital play, the “prize” is the eventual sale of your interest in the business at a higher price – either when the venture attracts a future funding round, is sold, or goes public. UBIT only applies to operating income, not the gain in equity value. In many such cases, the operating income in the start-up phase is not always significant, and may even be offset by losses in the early goings or investments into R&D or other business assets. As such, UBIT will apply to the income, but the tax burden will be negligible. When the business hits the next level and you get to sell the shares your IRA purchased for $100 each at a price of $500, $1,000 or more, that gain in equity value is not taxed. In this type of scenario, investing with IRA or 401(k) funds can make a lot of sense. View and download our full checklist to learn more about investing in businesses with a self-directed IRA.